She was being loaded into the holding pen of the Madina Live Poultry market where goats, sheep, turkeys and other animals awaited death.... such “live kill” markets are extremely common in urban areas — they serve people from many different cultures. She saw an opportunity and made a break for it! Kayli will spend the rest of her life unharmed, care-free and surrounded by loving people who see her as a life to be valued—here WITH us and not FOR us. 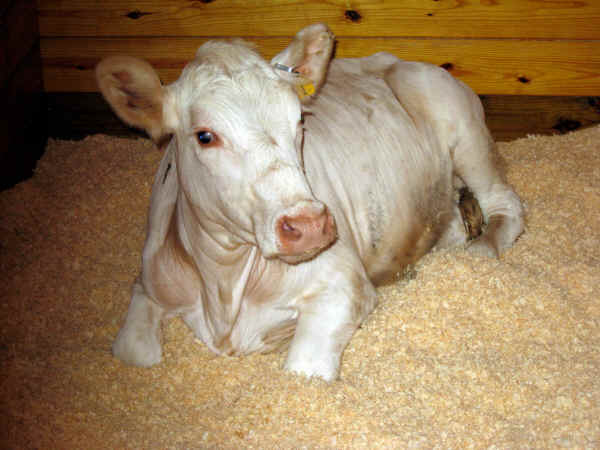 Kayli, a young white cow, made a dash for her life from a slaughterhouse just outside of Philadelphia. June 18th: She was being loaded into the holding pen of the Madina Live Poultry market where goats, sheep, turkeys and other animals awaited death. 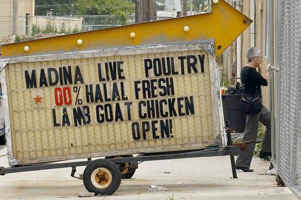 This particular market is a Halal slaughterhouse catering to Muslim customers, but such “live kill” markets are extremely common in urban areas — they serve people from many different cultures. She saw an opportunity and made a break for it! Within hours she was captured by police and brought back and led into the same pen with the other doomed animals. 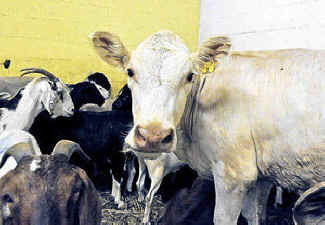 Animal activist Marianne Bessey, a Philadelphia attorney, heard how the cow had run for her life and was moved to help. She went to the slaughterhouse, and begged for Kayli’s life. When it seemed hopeful she might be released, WFAS Farm Manager Sheila Hyslop took our horse trailer and made the 4-hour journey there with dedicated volunteer Mike Stura. But the slaughterhouse workers became intimidated when the press and other activists arrived and refused to release the cow. They locked the doors and left the premises. Kayli at the slaughterhouse...with less fortunate animals around her. Elissa Katz, an animal advocate and close supporter of WFAS, contacted the Council on American-Islamic Relations to act as a go-between. The Executive Director, Moein Khawaja, heard her pleas and stepped in to help. After all-day negotiations with state officials and the slaughterhouse owner (who was out of the country at the time), the eventual release of the young white heifer to WFAS was approved! In fact, she was officially “pardoned” by PA Gov. Tom Corbett’s office and the state’s Department of Agriculture, which waved a law that requires an animal be killed within 10 days of arriving at a slaughterhouse. Clean and comfortable in her quarantine space.. Safe for the rest of her life. Now named Kayli, she has been checked by the vets and is undergoing 2 weeks of mandatory quarantine before she can be transported from Pennsylvania to our New York sanctuary, where we will greet her with open arms! Here, she will spend the rest of her life unharmed, care-free and surrounded by loving people who see her as a life to be valued—here WITH us and not FOR us.